As reader Li, an international road warrior, says, “America is getting to be just like Italy, except without the attractive men.” While the US has always had some corruption (and it’s been rampant at points in our history), it’s been striking to see how conduct that would have been deemed thirty years ago as unacceptable within the ruling class is now seen as business as usual. And in keeping with increased social acceptance of chicanery (at least among the upper classes) has come a spate of economic articles that contend that corruption can spur growth. This post argues that “corruptionomics” is costly. While Italy is a standout case, NC regulars will not doubt see the parallels here and in other advanced economies. In line with its National Reform Programme for the period 2015-16, Matteo Renzi’s government obtained parliament’s approval on a new anti-corruption law on May 21. We document the sheer size of corruption in Italy and argue that tackling it is not only a matter of fairness, but also crucial to boost the country’s potential output after three years of recession and almost two decades of stagnation. Experience from past success cases suggests that only forceful and comprehensive actions will succeed in bringing corruption under control. The problem of corruption in Italy is real and large. Transparency International’s Corruption Perception Index, the most widely used indicator of corruption, shows how Italy occupies the last place in Europe and 69th in the world, on par with Romania, Bulgaria, and Greece. This picture is confirmed by other organisations. The World Bank’s indicator for Control of Corruption ranks Italy 95th out of 215 countries, again neck and neck with Greece, Romania, and Bulgaria. The WEF ranks Italy 102nd out of 144 countries on indicators related to ethics and corruption. The economic consequences of corruption can be dissected in two classes: static and dynamic. Statically, corruption leads to the creation of deadweight losses, as it drives prices above their marginal cost of production. This implies a loss for both the public (e.g. in the form of investment projects being more expensive) and the private sector (e.g. in a bureaucratic procedure costing more to execute). The Italian Court of Auditors estimates these direct costs of corruption to be in the order of magnitude of €60bn per year, equivalent to roughly 4% of the country’s GDP. 1. Domestic investment: Corruption not only reduces investment profitability, but also generates uncertainty in the returns to investment. This in turn will affect a country’s total factor productivity and potential output. Empirically, Mauro (1996), Dreher and Herzfeld (2005), Pellegrini and Gerlach (2004), only to mention a few, test this channel and all find a statistically significant negative effect of corruption (however measured) on investment. 2. Foreign Direct Investment: for the same reasons mentioned in point 1, corruption also directly reduces inward FDI, as argued by OECD (2013a). This is particularly problematic as the latter is associated with the international transfer of technology and management know-how, and hence the rate of technical progress – all crucial contributors to long-term growth. 3. Competition: Corruption can weaken antitrust enforcement, create barriers to new entry, or generate other barriers that preserve the privileges of established firms, as documented by OECD (2010). Weaker competition will affect productivity growth and innovation, as spelled out in Mariniello et al (2015). 4. Entrepreneurship: As rewards from entrepreneurial activity shrink, potential entrepreneurial talents might be diverted to alternative carriers in rent-seeking activities, as argued by Murphy et al (1999). The result will be less entrepreneurs, less start-ups, less innovation, and ultimately, lower growth. The validity of this channel in developed economies was recently tested and confirmed by Avnimelech et al (2011) by using a unique LinkedIn-based dataset. 5. Quality of government expenditure: Corruption will impact the level and composition of government expenditure. Firstly, it will increase the cost of goods and services purchased by the public sector, reducing the funds available for productive government use. Secondly, it will affect the composition of expenditure, as resources will be diverted to headings where corruption can be more easily concealed (see IMF, 1998). And indeed the symptoms summarised in Figure 1 are all there. Although these might be individually due also to other factors, their joint reading seems to suggest that corruption might be weighing on long-term growth precisely through the channels identified by the literature. In terms of competition, 90% of Eurobarometer survey respondents agreed that corruption is part of the business culture in Italy: the highest value in the EU28 (see Figure 2 above). Similarly, and perhaps more worryingly, 75% believe the only way to succeed in business is to have political connection: the second highest value in the EU28, after Cyprus. This is perhaps unsurprisingly paired with one of the lowest (and declining, even pre-crisis) shares of start-ups among OECD EU economies, as displayed in Figure 3 below. Gross fixed capital formation is close to a 20-year low. 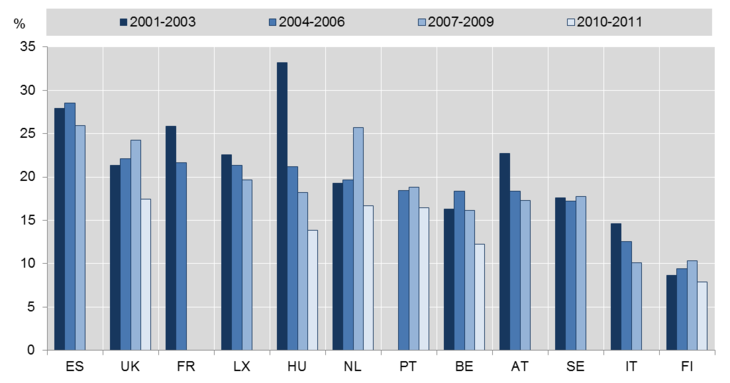 The stock of FDI inflows was around 20% of GDP in 2013, the smallest figure in the OECD EU after Greece (11%). Regarding the quality and composition of Italy’s government expenditure, I will only report one striking number: for large public works alone, the Italian Court of Auditors estimates corruption (including indirect losses) to amount to as much as 40% of total public procurement value. It must be acknowledged that a niche (largely model-based) literature suggests that corruption might be beneficial to growth in so far as it allows to bypass overburdening government regulation (e.g. Leff, 1964). However, this is not of great relevance to the Italian case as these studies were focused on developing and least developed countries, where institutional quality is extremely poor. Furthermore, the empirical literature is quite unanimous in acknowledging a strong and negative relationship between long-term growth and corruption (for a review of the empirical literature, see Campos and Dimova, 2010). Over the past few years, a wave of corruption scandals has pushed successive Italian governments to take policy action. In November 2012, Mario Monti passed a large anticorruption law, aiming at preventing and prosecuting corruption in the public administration. Renzi’s government has largely been pushing for a toughening of those provisions. However, past success cases suggest that more forceful action will be needed if corruption is to be significantly curtailed. 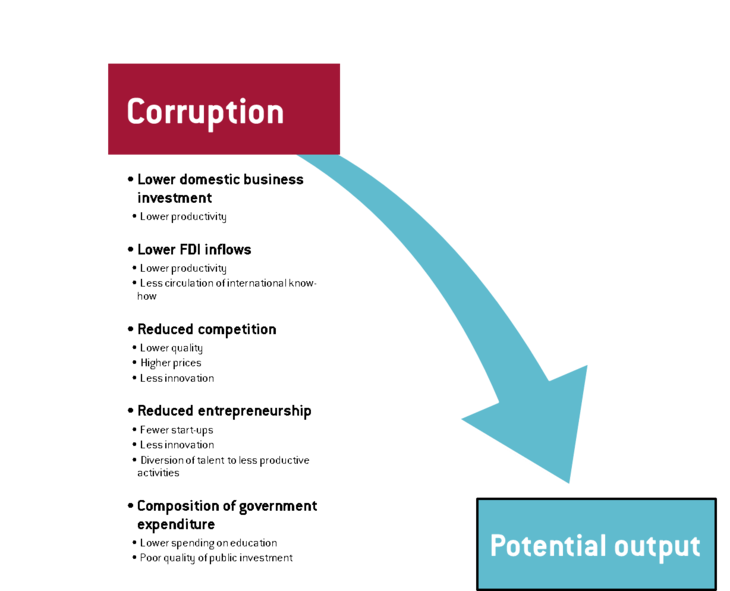 Seeking to reduce corruption mainly by punishing corruptors and corrupted, without changing the institutional arrangements that made it possible for corruption to emerge, is unlikely to prove successful (OECD, 2013b). Past cases like Singapore and Hong Kong show how the key words of an effective and radical anticorruption campaign should be: i) simplification, ii) transparency, and iii) clear accountability. Extrapolating these principles to an Italian context could mean, for example, adopting a wide-ranging Freedom of Information Act, regulating lobbyism, restructuring public examinations with the aim of improving bureaucratic quality, furthering the use of job rotations within the public sector, abridging government formalities and paperwork, privatising public utility companies or, at least, reducing their monopoly power. To codify and ingrain these key principles in all levels of government activity, “persistent political will and vigilance, including at the highest level of government” will be needed (OECD, 2013a). Tackling corruption in Italy is not only a matter of fairness, at a time when citizens are being asked to tighten their belt, but is likely to have major repercussions on the country’s private and public investment, FDI, competition, innovation, and ultimately, long-term growth. All of which, Italy is in dire need of. Throughout this contribution, corruption is defined in the broadest of senses as “the abuse of entrusted power for private gain”, in line with Transparency International. Spain is also depicted, as a country that is currently undergoing a wave of corruption scandals. See “Boost for Italian economy as investment climate starts to warm” – Financial Times, 8 April 2015. See “Recent trends in FDI activity in Europe” – Deutsche Bank, 21 August 2014. “The origins of the country’s persistently superior performance in corruption control can be traced to the radical reforms designed and implemented by the People’s Action Party (PAP) during the period 1959/60, which transformed the country from one plagued by corruption to one of the ‘cleanest’ in the world” (OECD, 2013a). Bianco (2012) shows how factors particularly associated with corruption are, inter alia, excessive bureaucratic burdens and low quality of the bureaucracy. Without a specific lobbying regulation, nor an established registrar of lobbyists, Italy ranks as one of the worst countries in Europe in terms of transparency of lobbying, and is hence at high risk of suffering from an undue influence of the private sector on public decision-making (see Transparency International, 2015). For example, the World Bank’s 2015 Doing Business survey shows how dealing with construction permits (for a warehouse) takes on average 233 days (against 150 days in the OECD), putting Italy on the 116th place in the world. This entry was posted in Banana republic, Economic fundamentals, Europe, Free markets and their discontents, Guest Post, Regulations and regulators, Social values on May 26, 2015 by Yves Smith. …and, in fact, is just another form of kayfabe. The system must remain in place so that those doing the punishing can continue to use it to their own benefit. You think Renzi didn’t have to engage in a little corruption of his own to get into the top spot in the gov’t? Nothing like some comical sexism to start this otherwise interesting article. For me at least, I find cats, of any gender, to be far more attractive than men anywhere. Well, for Italy as well as the US, the choice seems limited to Fat Cats. If it helps, my girlfriend has also complained that few American men are good-looking. I suggest taking the plea bargain, and not fighting that charge in court. I stopped reading there. Nobody knows what the size of corruption in Italy is. That number is completely made up. It exists purely as a function of shoddy research referencing each other, like a serpent eating its tail (Italians are as guilty of this as anyone else, and so is the European commission). It’s originally from 2009, and it comes from an Italian report that actually quoted it to say it was “just an opinion based on no economic modelling”. The Italian Court of Auditors never wrote a report with that estimate in it. If the rest of the research is as shoddy as that I feel no qualm in ignoring it completely. Accusations of corruption in Italy have just become a weapon to further dismantle the welfare state. “The State its corrupt, let’s hand all of its functions to the private sector instead”. I agree that its impossible, by definition, to underestimate the amount of corruption relevant to GDP, since you are trying to measure illegal activity that people are trying hard to keep secret. At best, you can do the sort of international comparisons that Transparency International does, and even these are very difficult to do and the existing ones are flawed in various ways. Where I disagree is that I’m certain that the study underestimates corruption. Again, since this is an illegal activity that people try to keep secret, I don’t see it as conceivable than an “official” estimate of corruption could do anything but underestimate it, possibly excepting estimates from the government of one country about a country that it considers an enemy. Spending by a monopoly will always cause corruption. We can absolutely discuss the problematic concentration of corruption in finance and business, and whether (and which) redistributive policies will serve to more fairly distribute the spoils. Corruption is the antidote to Monopoly. When the game is fixed, the gamed get gaming. The scorpion can’t help but sting the frog or turtle that provides the transport across the river; thanks for the lift! It’s their nature. Are you claiming that Austerity Prevents or Eliminates Corruption? Because you will find that austerity generates even more corruption, since without a lever to winkle some money out of the system, more people are deprived of the means of life than would be true under a functional government that provided for its citizens and upheld the rule of law. Too bad the author cites privatizing public assets (utilities) as a means of combatting corruption. Just the opposite. it’s just depressing that even this blog doesn’t realize that the so-called fight against corruption by those who have largely instutionalized corruption is just a means to further destroy what is left of the public social net. Renzi and his PD are the ones who have introduced legislation (jobs act) to allegedly fight unemployment by generalizing precarious work conditions. That’s one of the sneakier neoliberal traps. I assume Yves posted the work only to show the cost of corruption, in general, rather than as a blanket endorsement of the post. That’s how it usually goes. At nc, I assume good faith. True. In Spain, privatization of public health has proved to be a sink of public money to pay bribes to the politicians, for instance. Italy should just do what everyone else does: legalize and institutionalize corrupt practices. Italy has a better and more efficient healthcare (& delivery) system than the US. And a higher percentage per population of good cooks. Really, the “solution” to “corruption” is doubling down on neo-liberal economics? Isn’t that the source of increasing corruption to begin with? Not the key to combating corruption here is the privatization of public utilities and expenditures to ensure “competition” as a universal elixir. An entertaining documentary film which presents some fine examples of the rotten corruption in Italy was released a couple of years ago called: ‘Italy, Love It Or Leave It’. It stars a charming & knowledgeable young European gay couple, Luca and Gustav, who previously made a film on (lack of!) gay rights in Italy. Through the lives of everyday Italians, the couple are able to perceptively show both the horrors (lack of human rights, lack of job security, lack of accountability with public funds, lack of intelligent politicians……) and delights of Italy (which include a truly remarkable & humane City Governor who is Communist, Catholic and Gay!). In 1982 I just completed six months cleaning up work in Australia for an office of a Big 8 firm. I was ranting at lunch with a number of other US expats about how corrupt everything was in Australia when another American expat who had just completed 3 years in Italy started tellling me all the things he had dealt with in Italy. Having done work in Northern Europe I can tell you it was not that way in N Europe – at least for American clients. In other words this is nothing new in Italy, it has been this way for 30 years. i always thought the rest of the world would come to the US standard when in fact it has gone the other way with the US sinking in the muck. I can tell you that I see things that I know 30 years ago would have sent you to prison or at least you would never have worked again. One time, before Sarbanes, I had an HR executive tell me I had to learn to be more flexible. The ways to reduce corruption have been clearly identified and are easy to implement. The question is why it has not been tried forcefully. And the answer is easy: because the incumbents benefit from the lack of transparency, accountability as well as complexity. This is true for any economic activity no matter if it is privately or publicly managed. And the one area of the US that leads in corruption is New York state. It leads in the hypocrisy list, stating it is great for business and overall freedom, while practising the exact opposite. The state government makes Italy look like a beacon of wholesomeness!